Enjoy your favorite music on road as the Alpine SPR-M700 speaker creates rich base and thumping sound while offering rich music. This 7-inch Alpine 2-way car speaker produces an astonishing amount of deeper and stronger bass. To protect the tweeter from excessive voltage, this Alpine 7-inch speaker system features a built-in tweeter protection. To deliver superior quality frequency response and amazing protection against moisture, oil, heat, and chemicals, this Alpine 2-way car speaker is enclosed with Santoprene. 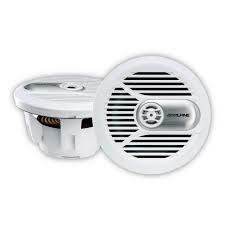 The Alpine SPR-M700 speaker is covered with ultra UV resistant grill that adds maximum durability with UV protection. This incredible Alpine 7-inch speaker system delivers a power range of 2-50 watts RMS that produces dynamic nature of music.